Gary Illyes from Google made the comment on Twitter that Panda is still coming but it is still in the “soon phase” and is unable to give an ETA due to technical reasons. While Illyes refers to it as technical reasons, it is likely he simply is referring to the fact Google seldom pre-announces update dates – with the sole exception of the mobile friendly update – in case they are delayed for whatever reason, rather than a technical “problem” resulting in a delay. 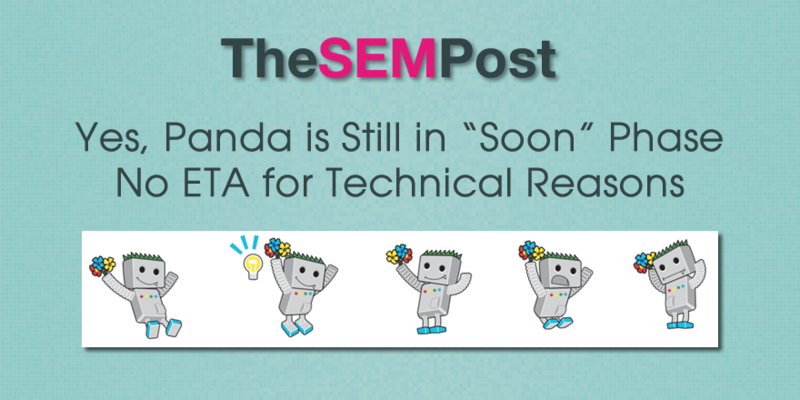 Everyone has been eagerly awaiting the next Panda update since Illyes first announced it at SMX Advanced at the beginning of June, when it was said it was 2-4 weeks away. However last week, John Mueller stated he imagined that it would likely be happening in the next couple of weeks. And Illyes comment last week that he should stop giving time frames, for when things get delayed for whatever reason. So looks like we might be waiting a little bit longer, but it is still planned to be refreshing “soon”…. which is better than not having any idea of when we could see the refresh at all, which we did for many, many months prior to Illyes announcement at SMX.